By the way, according to Publishers Weekly, I'd Tell You I Love You was preempted by Disney based on a mere two chapters and an outline. Total way to go, Ally! And I'm looking forward to reading Solitaire as soon as it's out in December. Every now and then you see someone you remember with only the fondest of memories, and this morning that was the case for me when seeing Mr. Ben "Pippin" Vereen on a morning wake up show here in NY. Ben Vereen was an invited co-host for this morning's show, and along with talking about his current success as a new cast member of the Broadway show, Wicked, he appears to be a man who is SO much at peace with himself these days, after many trials and tribulations that have occured in his life. But Ben's looking wonderful and it was such a pleasure to see him, and remember how I stood to my feet and cheered this super-talented guy at the curtain call when he appeared in the mega-hit show Pippin on Broadway back in the 70s. He later won a Tony award for the role -- and no award was ever *more* deserved than that one was! Great to see you this morning, Ben. I'm sure last week's giant Snapple Popsicle incident in Union Square Park managed to temporarily overshadow the recurring protests outside the Union Square Cafe just a few steps away, over the offering of foie gras (more commonly known as "duck livers")on the menu. And, as always, I'll post a related article here and let you be the judge. However, personally speaking, the question of: "What next...chicken livers?" can't help but come to mind. And inevitably, there goes mom's generations-old giblet gravy recipe out the window as well. Quoting one of the sign-carrying protestors outside the Union Square Cafe: "This is the result of French chefs with too much time on their hands." Or, could it be the result of a few folks on their days off from work with a little too much time on theirs? In either case, I'm sure the feathers will continue to fly over this one. Hot, humid, and just downright tacky weatherwise here in NYC. Ugh. Nevertheless, I hope it's at least a little more comfortable wherever you might be, and have a good one today! Peace. High marks go out to presenter, Emeril Lagasse, and the Food Network Channel for their production of last night's live Next Food Network Star results segment, and big congrats to this year's winner(s), Chicago caterers and cooking duo, Dan Smith and Steve McDonagh. Congratulations also to the culinary editors, judges, directors, and all others who basically took this competition out of the usual TV reality show realm -- and made it unique and interesting to watch. And of course, many words of praise and well wishes go out to finalist and runner-up, Deborah Fewell of Pasadena, CA., who was I thought was rather impressive throughout the entire contest. Looking forward to tuning in to see Dan and Steve's new Food Network cooking showcase soon as the network's newest stars. I'm back (albeit a day earlier than expected) from a week of networking, learning, fellowship - and yes, sometimes just plain, old bad-assed FUN! This year's IWWG Skidmore happening was just as successful as always, and would take far too many hours to outline, so I'll simply say that you just "hadda be there." And if not this year, there's always next year, and the next, and the next. Good stuff indeed, sponsored and attended by some truly great people in the writing life! 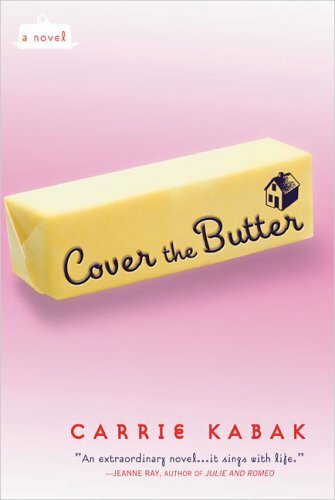 And on my way home, I was able to pick up my good friend Carrie Kabak's novel, Cover the Butter, which hit the bookstore shelves last Thursday! Clearly, this lady can describe the plight of a harried mom of a teenaged son -- like very few can. God, I was nodding my head in total agreement with the protagonist, Kate Cadogan, before I was barely through the first few pages! Truth told, I haven't been able to put down since I got home. Well done, Carrie. There's no question that you've already hit the ground running with this stunning debut. Total way to go. Before I'm even finished with this one, I'm already looking forward to your second novel! Anyway, let's try and make it a great weekend, all. Peace. Surely, we've all got those other blogs out there that we just can't help stopping by for a look-see as often as we can. And one such blog which is such a favorite ofmine that I never miss an entry is Superchef. It's published by Juliette Rossant, the original "Celebrity Chefs" columnist of Forbes magazine and author of Super Chef: The Making Of The Great Modern Restaurant Empires, which is a in-depth and insightful look at the makings of some of the world's best chefs (male and female) and the story behind their celebrity. Yes, I've read the book too -- and loved it. As for her blog, I usually try to catch it blog on a daily basis, and today's entry is so spot-on regarding my own assessments of the new Fox series Hell's Kitchen and it's drill-sergeant culinary taskmaster, Gordon Ramsay. Juliette basically say it all here , so I'll just leave it to her words on this one. Another great entry to this blog was a recent one on the Food Networks' new (female) Iron Chef, Cat Cora. And yes, I do agree that this was a seriously * wise* move on the part of the producers of this cooking showcase, with master chef, Cora, certainly capable of handling this new title that has been bestowed upon her. No doubt, with all the recent idiocy afoot with people with seemingly NOTHING better to do than surfing through blogosphere for the purpose of "trashing" what bloggers have to say, the flip side of this clearly indicates that this surfing time could also be put to time far better spent. Way to go, Juliette! Terrific blog, and please do keep your thoughts and insights on the culinary world coming for all of us who are interested in what you have to say. Make it a Friday, and an even better weekend, all. Peace. It was the May of 1995, and my husband and I had gone shopping for bathroom tiles one Saturday afternoon in Scarsdale, NY, and somehow came home with two tickets to a tiny island in the Dutch West Indies called Aruba. They were sold to us by a diligent Liberty Travel representative named Karen, who is one of the best salespersons I have run across to this very day, after luring us inside from where were browsing the travel specials on the outside display window. I have a vivid memory of stepping off the plane into the airfield of tiny airport after we landed, and being hit by the forceful trade winds that this island is known for. My other fond memories include the pristine waters and sandy beaches, and a special feature of this particular island, which is a mini "desert." Yes, that's right. Aruba has a desert area, complete with cacti, aloe plants (another thing this island is famous for) and a dusty aridness that could easily remind you of the Mojave. Touring this area in an army-style jeep was quite a bumpy experience for my husband and me, reminding us both of the old TV series, The Rat Patrol. There's also a strange bush-like tree with branches that grow "sideways" throughout this island called the divi-divi tree. And along with the spectacular, multi-colored Tucan birds that many people keep as pets, and a charming language made up of Dutch, Spanish, Portuguese, and a few other languages thrown in, called Papiamento, it was one of the most charming and idyllic places I think I've ever visited. God, how could I ever forget sitting at a poolside bar with my husband one afternoon, and having the bartender, who spoke several of these languages fluently, including English, help to conduct conversations between people who couldn't speak a word of the others language. He'd simply ask my husband a question someone who spoke Dutch had asked in English – and then he'd shoot it back to the Dutchman in Dutch, or Spanish, or Portuguese, or whatever the guest happened to speak. This guy was truly amazing, and number one in "bringing people together." In fact, I'd have to say that each and every native person that I came in contact with on the island of Aruba were some of the kindest, most accommodating people you could ever ask to meet. Every one. Therefore, I'll continue to hope for the safe return of Natalee Holloway, the Alabama teen who still remains missing in Aruba. My hope is that everyone there will continue to be as kind, caring, and wonderful as they were to my husband and me when we were there, and help to find this young girl and reunite her with her family soon.